The 2017 USA Cycling Cyclocross National Championships opened Tuesday in downtown Hartford, Conn. with five non-championship events for men and women. Championship races continue through Sunday, Jan. 8, with collegiate and master’s events beginning Wednesday at 8:30 a.m. ET. Organizers expect more than 1,700 registered riders for the week. Rain and muddy conditions greeted competitors on the 3.4-kilometer course at Riverfront Recapture’s Riverside Park, which runs alongside the historic Connecticut River. Beginning at Noon, the men’s 23-39 non-championship event was won by Jack Kisseberth (Easthampton, Mass./JAM Fund-NCC), finishing the race in 31:48. 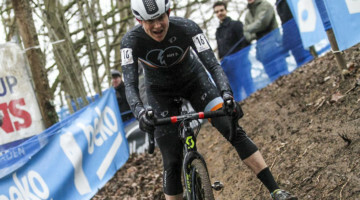 The women’s 23-39 and 40+ non-championship events were won by Julie Wright (Belmont, Mass./unattached) in 27:56 and Corey Coogan Cisek (Minneapolis, Minn./Power Fix CX) in 28:59, respectively. The men’s 40-49 non-championship event was taken by Adam Myerson (Dorchester, Mass./Cycle-Smart) in 36:06. The opening day concluded with J.W. Miller (Madison, Wisc./unattached) scoring a victory in 28:03 in the men’s 50+ non-championship race. 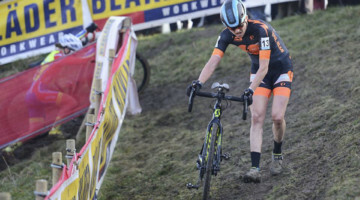 Stay tuned for Cyclocross Magazine’s full coverage of the entire week of title races starting Wednesday, and watch Sunday’s Nationals races live on Cyclocross Magazine from the warmth of your home. 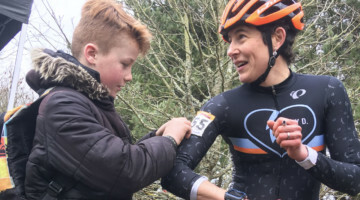 Next post Emma White and Ellen Noble Forge a "Beautiful Duel" in the U.S.
Why are pros racing the non championship races? Is this standard practice?